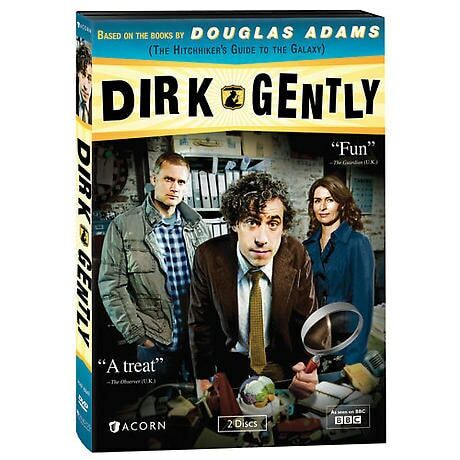 Dirk Gently is poorly dressed, perpetually insolvent - and uncommonly good at solving mysteries. Based on the novels by Douglas Adams (The Hitchhiker's Guide to the Galaxy), this rollicking BBC series follows the proprietor of the Holistic Detective Agency as he spins random coincidences into plausible explanations. Stephen Mangan (Episodes) is the affable star. With Helen Baxendale (Friends), Lisa Jackson (Daniel Deronda), Jason Watkins, and Bill Paterson. 4 episodes, 3 3/4 hrs, 2 DVDs, SDH. Struggling holistic detective Dirk Gently is hot on the trail of a missing cat when a chance encounter with MacDuff, an old college chum, leads to an even bigger case-the disappearance of billionaire Gordon Way. Dirk recruits the hapless MacDuff as his sidekick to solve the crime. Mr. Edwards, a paranoid computer programmer, hires Dirk to investigate whether the Pentagon is tracking his every move. Dirk dismisses him as a quack, but when he discovers Edwards's revolutionary software prototype, the detective realizes he's stumbled onto something big. Dirk and MacDuff are hired as security consultants at their old university. While Dirk is preoccupied trying to find out why he was expelled years ago, an immensely valuable robot is stolen. Later, Dirk's old mentor is murdered, forcing the duo to investigate while evading the police. Dirk's former clients are turning up dead, and a police inspector with a grudge against the detective would like nothing more than to convict him. Dirk and MacDuff race to find the killer before he can strike their newest client-a beautiful woman with a mysterious stalker.